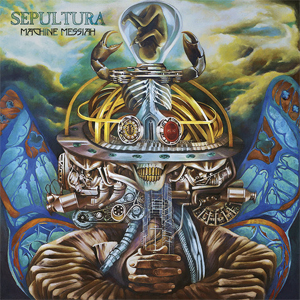 Brazilian heavy metal icons, SEPULTURA, will unleash their upcoming studio album, Machine Messiah"Phantom Self" they provide another thrilling look into their 14th studio release and deliver haunting images and sociocultural criticism in this clip directed by Mauricio Eça. Check out the video now on KNAC.COM right HERE. ""Phantom Self" starts with a short intro based on the Brazilian rhythm 'Maracatú', original from the Northeast region of Brazil", explains mastermind Andreas Kisser. "We mixed this very Brazilian sound with violins performed by a Tunisian violin ensemble, the Myriad Orchestra. This was a suggestion from Jens Bogren, the producer of the album, who worked with this orchestra before and he thought it could be a nice combination. We used the violins on different parts of the song and that opened a lot of new possibilities, specially for my guitar parts, it was great to have that conversation between guitar and violins making the part even more special. It’s a very heavy song, with a lot of groove, one of the most complete songs we ever worked with and it’s taking SEPULTURA to a new level!" Singer Derrick Green adds: "The lyrical idea came from an article that Andreas sent me. It was about a young man who had everything going for him and unfortunately was in a horrific car accident in the 70's. After the accident, he lost his entire idea of who he was. No one could figure out what was going on inside his mind. He would have glimpses of his former self but doctors realized that chemical elements of his mind had shifted. He had become an entirely different person within himself. There is this element of change that exists within all of us. This ability is important for our evolution as human beings to move forward even after traumatic events." The album was produced by the band and Jens Borgen (SOILWORK, OPETH, KATATONIA, AMON AMARTH) of Fascination Street Studios in Örebro, Sweden. The stunning cover artwork for Machine Messiah,/b> was created by Filipino artist Camille Della Rosa.